Editor’s Note: Today’s blog post was researched and written by our summer intern, Sadi Mosko. Sadi graduated from Boise High School in May, where she was an active member of the Boise Architecture Project. She left Boise just this week to begin her new adventures at Columbia University in New York City. She showed a great aptitude for research, and we hope she both continues to pursue her love of history and returns to work for us next summer. SHRA is headquartered in this historic building. What arose was the four-story red brick structure that stands today. It is a Chicago/Commercial style building designed by local architects John Tourtellotte and Charles Hummel. The first floor is a storefront, with large windows along Idaho Street that span floor to ceiling. The upper floors have double-sash windows. Various decorative details, like hanging black pendants, fall from the top of the building down the side. A curved false gable displaying the letters “F.O.E.” decorates the flat roof. Many different groups have occupied the building. The most notable is the Fraternal Order of the Eagles (F.O.E. ), for whom the building is named. F.O.E. is an international non-profit social and service organization. The national group was first established in 1898 and the Boise Aerie was up and running in 1901. In 1917, they moved into Jones’s new building where they occupied the top two floors. Arthur Murray School of Dance soon moved in, and turned the second floor into an elegant ballroom. Arthur Murray was a national sensation and social dancing expert. In the 1930s, his New York City dance school grew to become the largest dance school chains in the country. Murray and his wife, Kathryn, also had their own regular TV show. Today, people may not know how to do the “Lambeth Walk” or the “Big Apple,” but most will recognize Murray’s iconic footprints that show dancers where to step. During this period, the upper levels were vacant. Below, on the ground level were King Edward Cigars and Claire’s Uniform Shop. Other businesses that have filled the Eagle’s Building are Weil Distributing, a tobacco supplier, and Greens ‘n Things, a designer planter company. 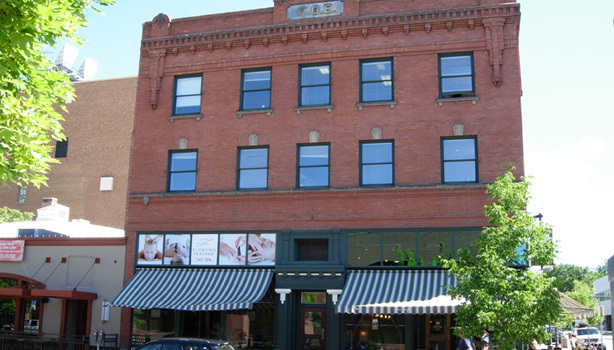 In the early 1980s, Boise-based ZGA Architects and Planners remodeled the building. The second and third floors were turned into office space while the ground floor continued to be a storefront. During the remodel, Noel Weber of Boise-based Classic Design Studio painted the two signs that now decorate the exterior. One sign is at street level along Sixth. Originally, it listed the names of the different businesses that resided inside. Today, the paint is worn and the list of shops is no longer there. The other sign is on the west edge of the building and reads “Eagles Center” in green and gold block letters that line vertically down the wall. Today, Java Coffee & Café and Spa Urbana occupy the ground floor. Offices are on the lower level and upper three floors, including SHRA’s suite on the second floor. 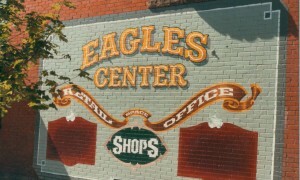 Since 1976, the Eagle’s Building has been on the National Registry for Historic Places for both its architectural and cultural importance. It is also a part of the Old Boise Historic District.